Russia will deliver 36 Yakovlev Yak-130 combat trainer aircraft to Syria. 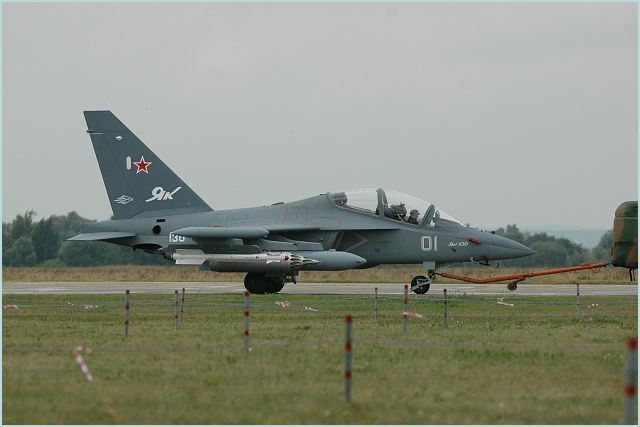 Russia and Syria have signed a $550-million contract on the delivery of 36 Yakovlev Yak-130 Mitten combat trainer, the Kommersant daily quoted on Monday, January 23, 2012, a source close to Russia’s state arms exporter Rosoboronexport as saying. Under the deal struck in late December, the jets are to be supplied to Syria once Damascus makes a prepayment, the source said. A source in the aircraft production industry told the newspaper the aircraft construction company Irkut is able to produce the jets for Syria in a relatively short time. Contacted by RIA Novosti, both Rosoboronexport and Irkut declined to comment. Analysts say the contract is “risky” given the worsening satiation in Syria and the growing international pressure on President Bashar al-Assad over his crackdown on protesters. The contract was apparently signed when the situation in Syria was “not as dramatic as it is now,” Pukhov said, adding that getting the Russian jets has likely lost its relevance for Damascus. “The Yak-130 plane is superfluous for attacking insurgents – these goals can be served by cheaper planes,” the analyst said. At the same time, he said, the jet cannot endure air battles with Israeli, Turkish, or Western coalition’s aircraft, should a military conflict erupt in Syria. Russia has opposed international sanctions, including an arms embargo, against Syria, where the death toll from clashes between protesters and government troops has reached 5,400, according to the United Nations. Earlier this month, the United States expressed concerns over weapons deliveries to Damascus following media reports about a Russian ship loaded with arms docking in the Syrian port of Tartus. “We are only trading items with Syria that are not banned by international law,” he said.